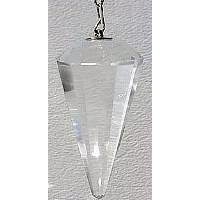 This is a Crystal Pendulum and Pendant all in one. 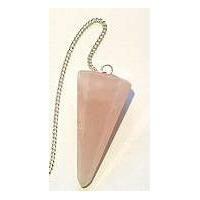 This pendulum has a single terminated Rose quartz crystal, a round silver alloy Crystal Cage holder that opens. 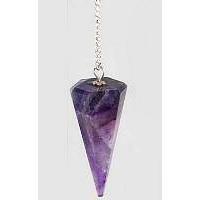 This pendulum can be filled with a healing stone, crystal but may also hold other items. To make it a pendant it has a lobster clasp in between the the cage and the chain that holds the pendulum pendant to the chain and the chain is easily removed. 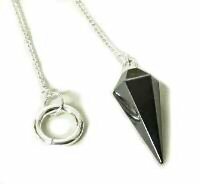 You can then clip the pendulum pendant to your favorite chain or cord to wear as a pendant. There are many uses for pendulums, including divination, dowsing, and answer finding techniques. 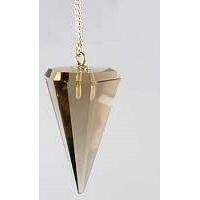 The pendulum is one of the basic divination tools. 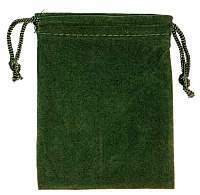 Used with a pendulum board or by itself, it can help determine the answers to questions or aid in general decision making. Rose quartz is a pink quartz stone of unconditional love and opens the heart chakra to all forms of love such as self-love, family love, platonic love, and romantic love. The elevated energy of quartz crystal gives rose quartz a property of enhancing love in virtually any situation.Rose quartz is soothing, calming and reduces stress and tension. It helps to clear anger, resentment, guilt, fear and jealousy. 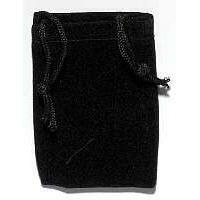 It helps balance emotions and heal emotional wounds and traumas, even grief, bringing peace and calm. Rose Quartz is also used to ease the process of transition in dying. Emotionally rose quartz brings gentleness, forgiveness, compassion, kindness and tolerance. It raises one's self-esteem and sense of self-worth. It can also heal and release childhood traumas, neglect, and lack of love, in part by enhancing inner awareness. It can help with reconciliation with family and others. Overwhelming or unreasonable guilt is eased by rose quartz. In the psychic and spiritual realms, rose quartz is often used to attract love, and for love spells. Rose quartz can be helpful for dream recall and dream work. Physically rose quartz is used in crystal healing to benefit the heart, the circulatory system, fertility, headaches, kidney disease, migraines, sexual dysfunction, sinus problems, throat problems, depression, addictions, ear aches, slowing signs of aging, reducing wrinkles, spleen problems, fibromyalgia, and weight loss. Rose quartz is also helpful and protective during pregnancy and with childbirth. It is also sometimes said that rose quartz is helpful for supporting brain functions and increasing intellect. The crystal is 1.25 inch, Total length is 9 inches. The cage will hold a stone up to .5 inch in size.